When it comes to making reservations to go eat out, I like to keep it as simple as possible, and also earn as many points as possible. I like to be able to make a reservation online, without having to call the restaurant. 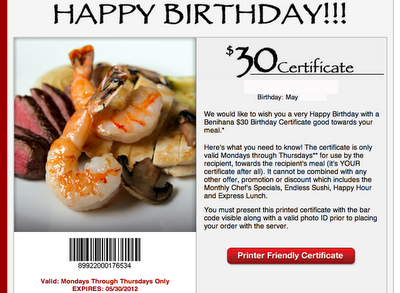 Did you know that you could get rewarded for making an online reservation at many restaurants? OpenTable is a service that provides fast, efficient, and free online restaurant reservations. The service has over 25,000 affiliated restaurants. You can make, modify, or cancel a restaurant reservation online at www.opentable.com or on your iphone with the OpenTable app. OpenTable has been around since 1998, and I always do a quick search with OpenTable before making dining reservations. When you make an online reservation, you can add requests such as seat location preferences. There is no need to call in to speak with anyone. OpenTable also provides restaurant reviews, directions and menu previews. If you’re not sure what you’d like to eat, simply plug in a date, time, and zip code and OpenTable will show you any available restaurants in your area. This will save you a ton of time trying to call different restaurants individually. 1000-point” reservations at certain restaurants and times. Points are awarded when a reservation is completed and may take up to 7 days after dining for the points to appear in your account. No points are given for cancelations or no-shows. What can you do with these points? Once you accumulate 2,000 points, you can get a $20 OpenTable Dining Check, which can be used at any OpenTable restaurant. Dining reward points expire if your account has been inactive for 12 months. When making reservations at OpenTable, you can check if the restaurant is affiliated with Rewards Network dining (Southwest Rapid Rewards Dining, American Airlines Dining, etc) to get extra frequent flyer miles. Don’t forget to make your purchase with a rewards credit card for extra points on top. My birthday is in this month, so today me and the lady are going to Benihana for lunch. 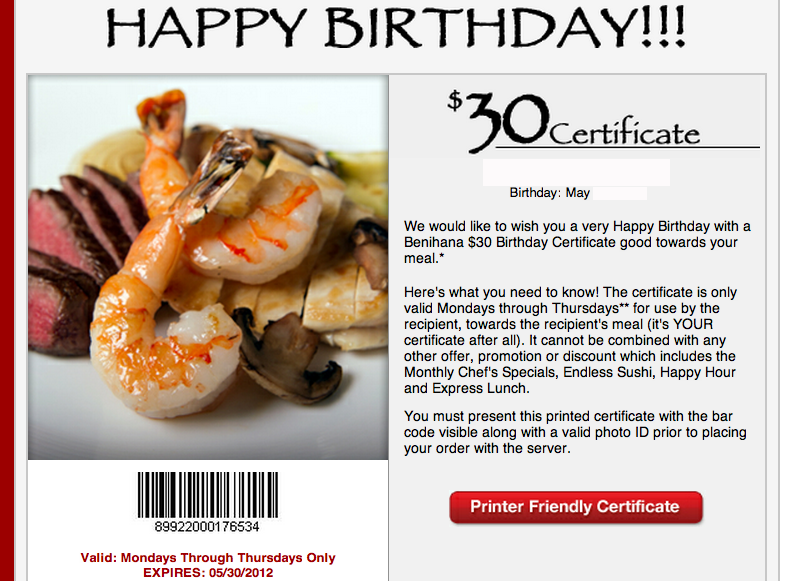 I've signed up for Benihana Chef's Table, and they give you a complimentary $30 birthday certificate (only valid Monday through Thursday, excludes alcohol, tax, gratuity) to be used towards my (recipient's) meal. This combined with a $20 OpenTable dining check that we earned will give us a free meal - and 100 OpenTable points for making the reservation online.